If you are a subscriber to this blog, you received an email yesterday announcing my latest book! The title is Traditional Old-World Easter-Egg Coloring Techniques…a DIY manual for creating colorful Easter eggs with natural, green European methods – taken from posts at www.ATravelForTaste.com. Living in Europe, I encountered some of the traditional ways people colored eggs for Easter. I tried the methods and posted the results to the blog in the past. Now, I’ve compiled all that information, along with basic instructions on boiling and blowing eggs, into this book. It’s available in print and Kindle versions. Get your FREE copy of the Kindle version of my latest book on Amazon! 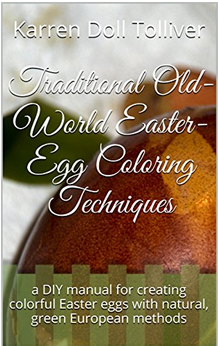 CLICK HERE TO ORDER YOUR FREE KINDLE VERSION OF Traditional Old-World Easter-Egg Coloring Techniques BEFORE MIDNIGHT, MARCH 5, 2017. Get the Kindle version FREE if you order and download before midnight on March 5, 2017. No code necessary; click here to just order it as you would any Kindle book on Amazon. Don’t have a Kindle reader? No problem! Download the free Kindle app on your desktop or mobile device. Now you can get my free book and read it, too! Even if you miss the deadline or just prefer the print copy, the prices are more than affordable. After midnight on Sunday, the regular Kindle price will be only $2.99. The print version goes for just $6.99. 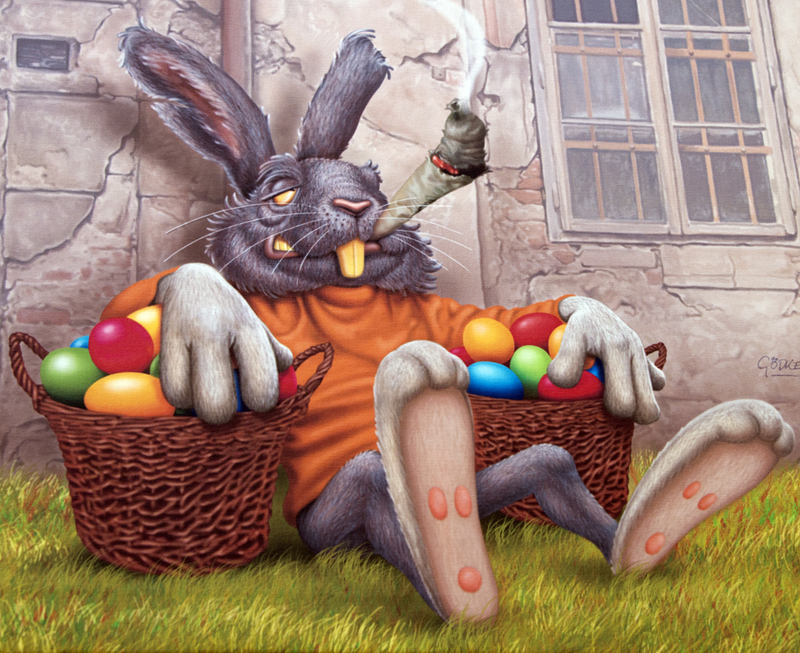 Get your free Kindle copy today before time runs out – and just in time for Easter! Click here to find all my books on my Amazon author page. After you download your freebie and read it – or any of my books – please rate it and post a review on Amazon. Thank you! Next I want to bring you some juicy info about a wonderfully fun restaurant called Cafe Karibo, pronounced the same as the reindeer’s cousin, caribou. 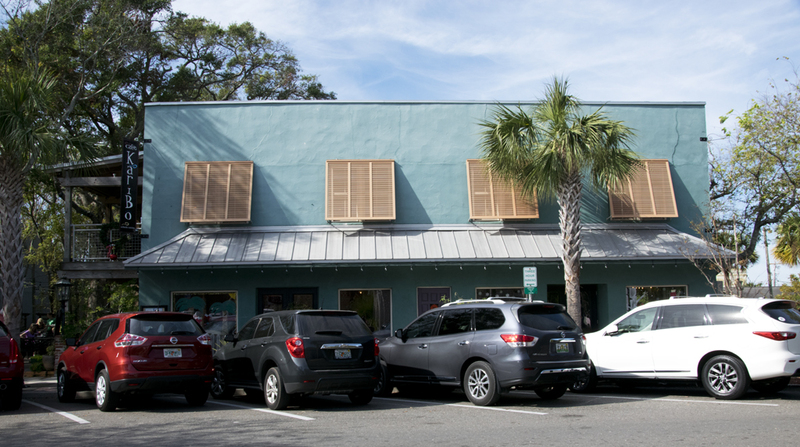 The restaurant resides in the quaint little, “Old Florida” town of Fernandina Beach on Amelia Island off Florida’s east coast. It’s almost to the Georgia state line. And in the ocean. My husband and I have visited Fernandina Beach a couple of times, and I highly recommend their Black Friday Pajama Party each year at Thanksgiving. 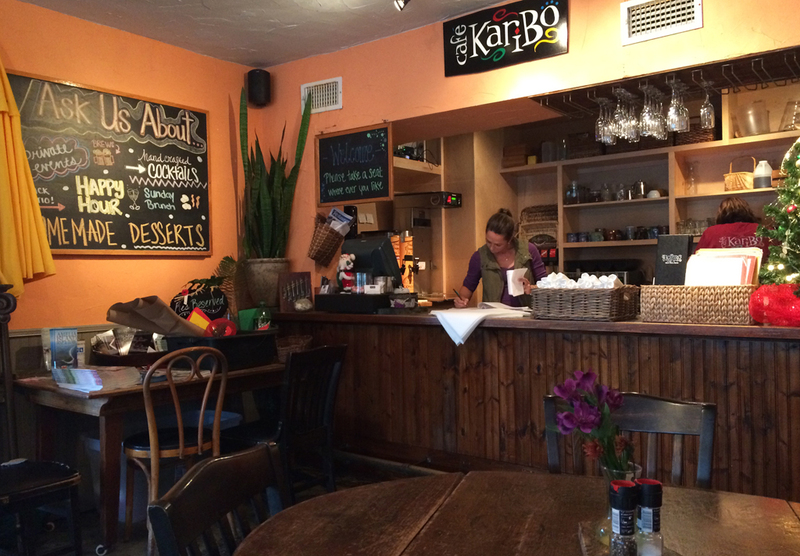 When we discovered Karibo on the first trip, we knew we’d be back. 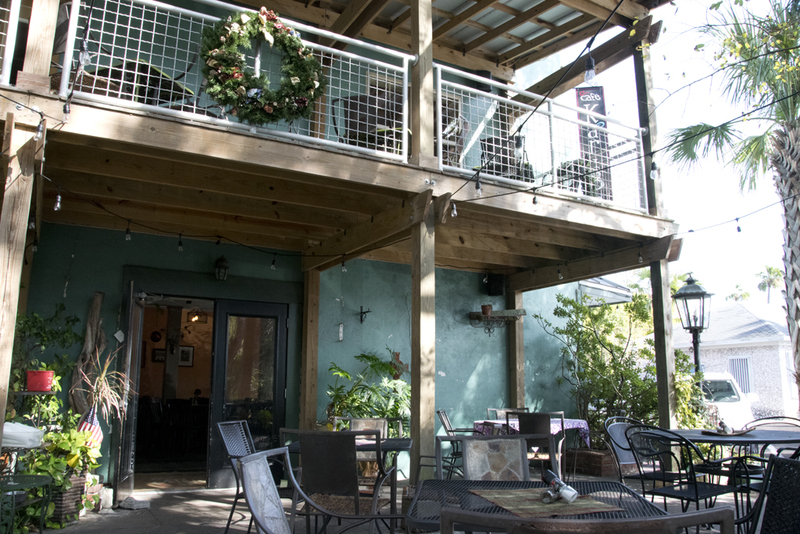 As with many establishments in the town, it’s located in a historic building, which houses not only the restaurant, but their brew pub as well, which has the tongue-twister name of Karibrew Pub. It’s named after their tasty, fresh, home-brewed beer, Karibrew. I recommend it! … or outdoors. But it’s most definitely NOT your typical touristy Florida grill! The crowning glory of a meal at Karibo is dessert. 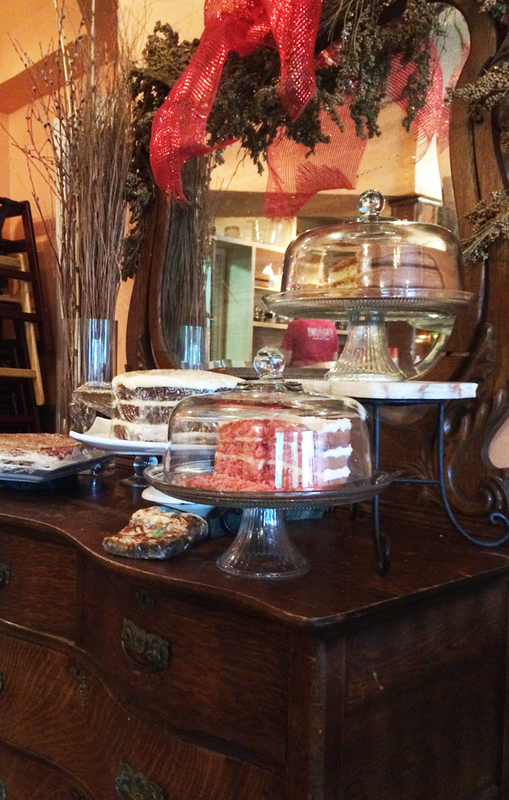 One of the owners makes these light and airy layer cakes that reach the sky. 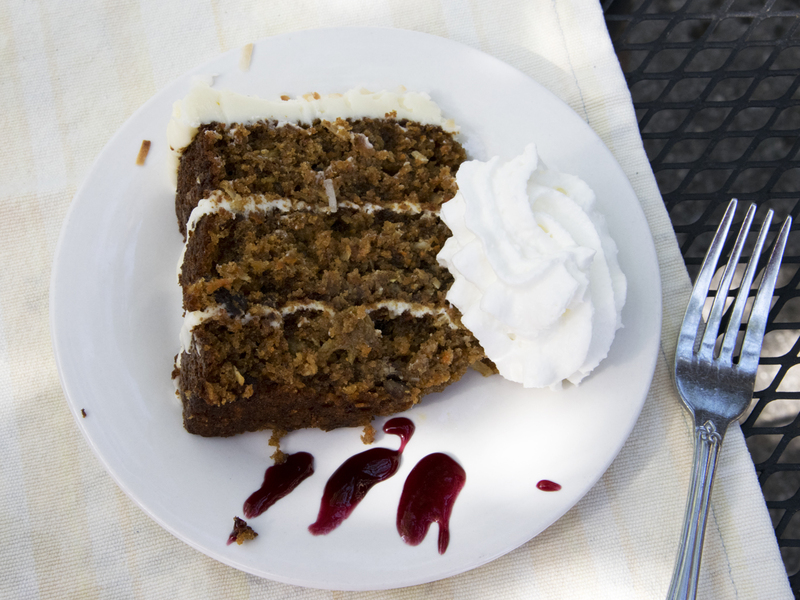 I still can’t believe how light it is – carrot cake is supposed to be dense, right? I’ve tried prying the secret out of several wait staff and the owner herself, but they are very diplomatic in avoiding a real answer. I’ll just have to go there to eat, I guess. 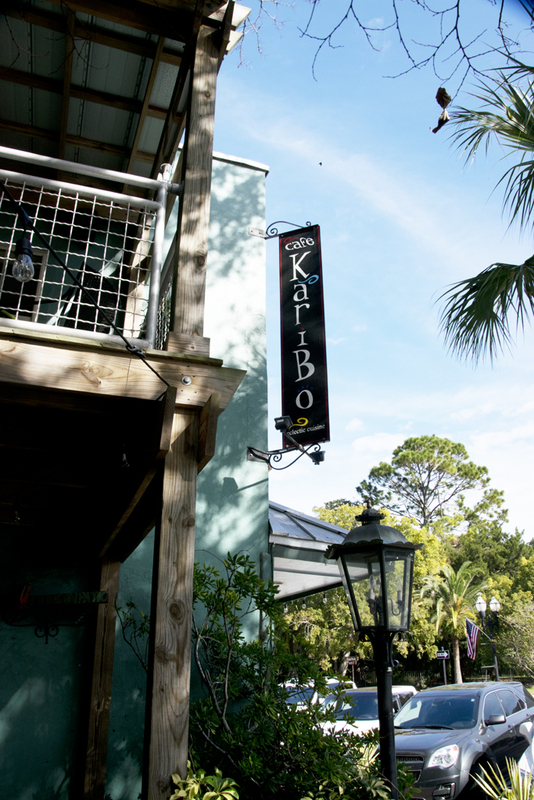 Karibo is a couple of blocks off Main Street, at 27 North Third Street in Fernandina Beach, FL 32034. 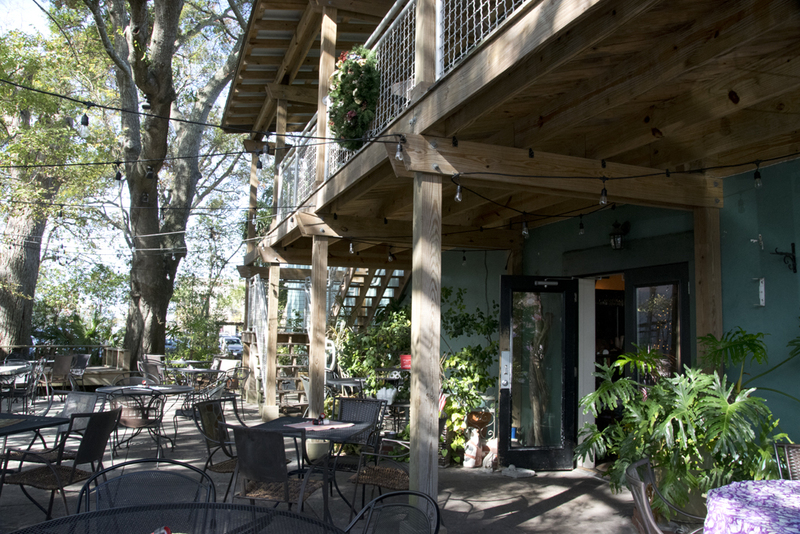 There are lots of other unique places to dine in Fernandina, but I like Karibo most of all. 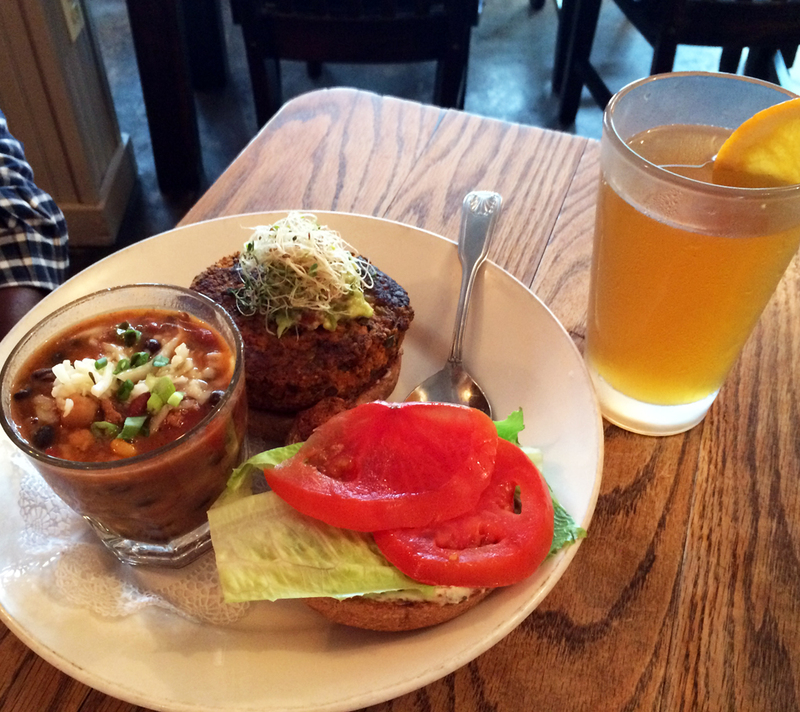 It’s great to stroll down Main, poking into the little shops and chatting with the townspeople, then head over to Cafe Karibo for a beer and some grub. I tell you, whenever I go there I feel like one of the residents. The whole town is very welcoming and friendly. I always hate to leave!